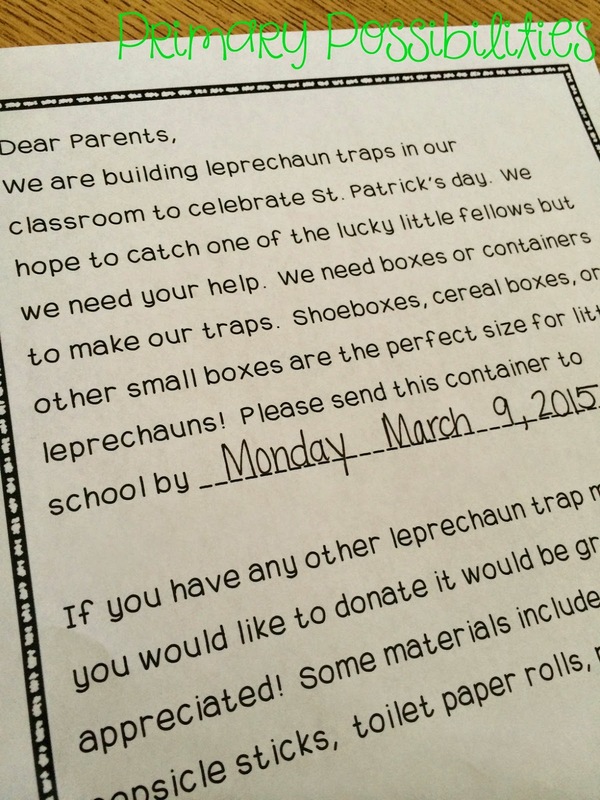 Primary Possibilities: Lucky Leprechauns and a Freebie! 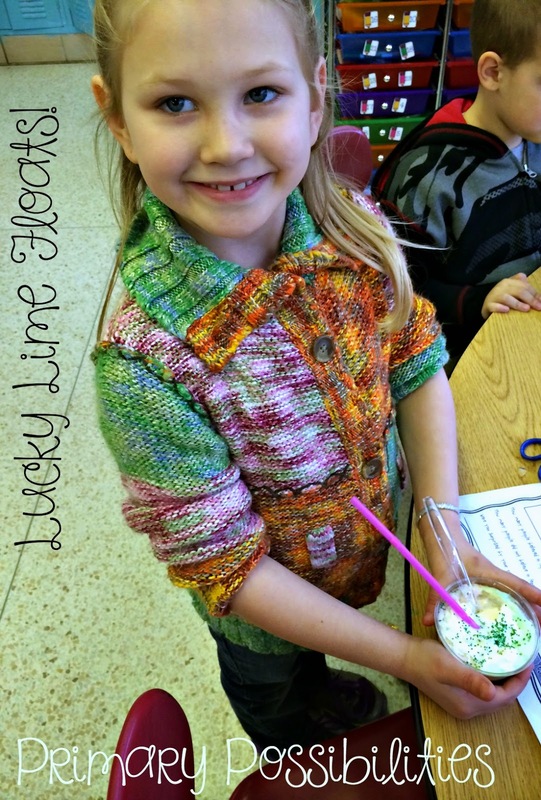 We have Spring Break next week so we celebrated St. Patrick's Day this week with Leprechaun Traps, a Leprechaun led scavenger hunt, and a Lucky Lime Float to finish off the day! I send home a letter to parents asking them to send in a box for the trap and any other items they would like to donate. We always start with a blueprint when making our traps. We discuss how architects make blueprints of buildings... they draw the front but they also draw the building like they are hovering above it. Architects also label all of the important details. They also make a list of the materials that they will need for their traps. 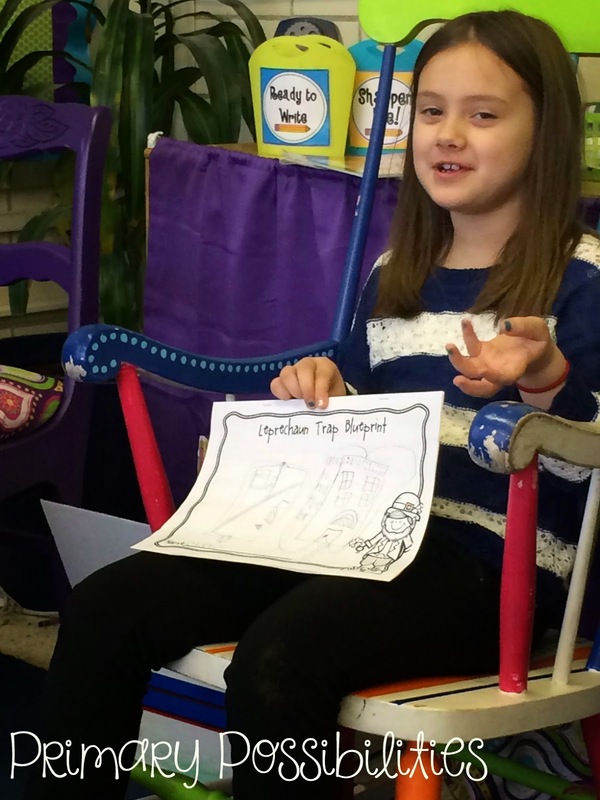 They share their ideas and explain how it will work. 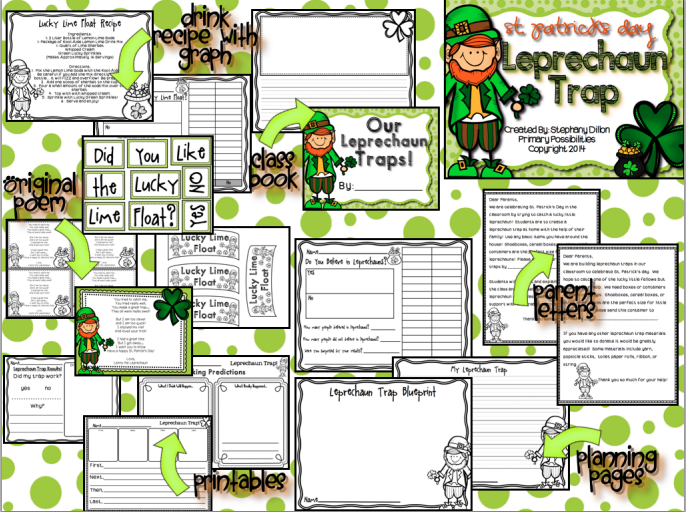 We troubleshoot and decide how they will make a door stay shut after the leprechaun has tripped a cord to make it close, how to keep the leprechaun from climbing out, and other leprechaun related issues. 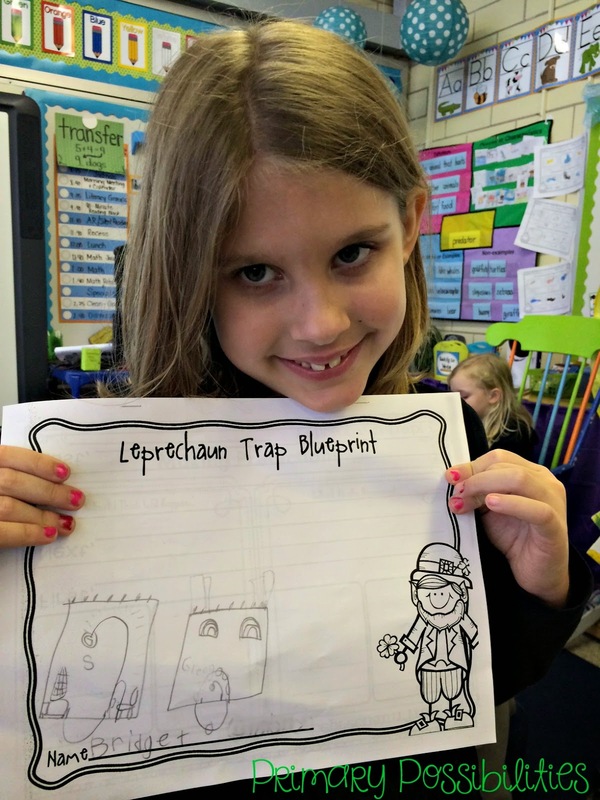 :) It's fun listening to them discuss the different forms of leprechauns based on the fictional leprechauns that we read about that week...how a certain trap might not work because the leprechaun was bigger in one story or smaller in another. And this is what you get when you turn your head for 5 minutes to wrap boxes and cut doors... some blingin' traps! What leprechaun could resist all that sparkle?! The girls know what they are doing (and they can go through two whole bottles of glitter in record time)! I always love the kids who just go off in their own little corner of the room and come back with a trap that they are so proud of! Once we have built the trap, the kiddos set them up around the room. They record their honest prediction for their own trap... Do they think it will work? We were about 50/50 this year! 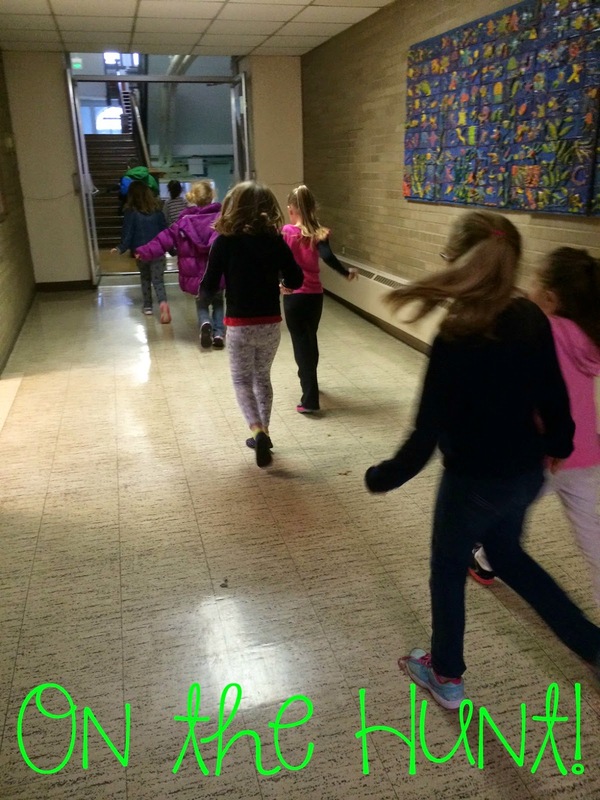 After we set the traps, we waited for a bit in the room but then we found a note from the leprechaun that sent us on a scavenger hunt through the building to find our missing Lucky Lime Float ingredients. After we found all of our ingredients, we rushed back to the room to find that all the traps had been set off but no leprechauns had been caught! The leprechaun had left us some new pencils and some treats for our efforts. 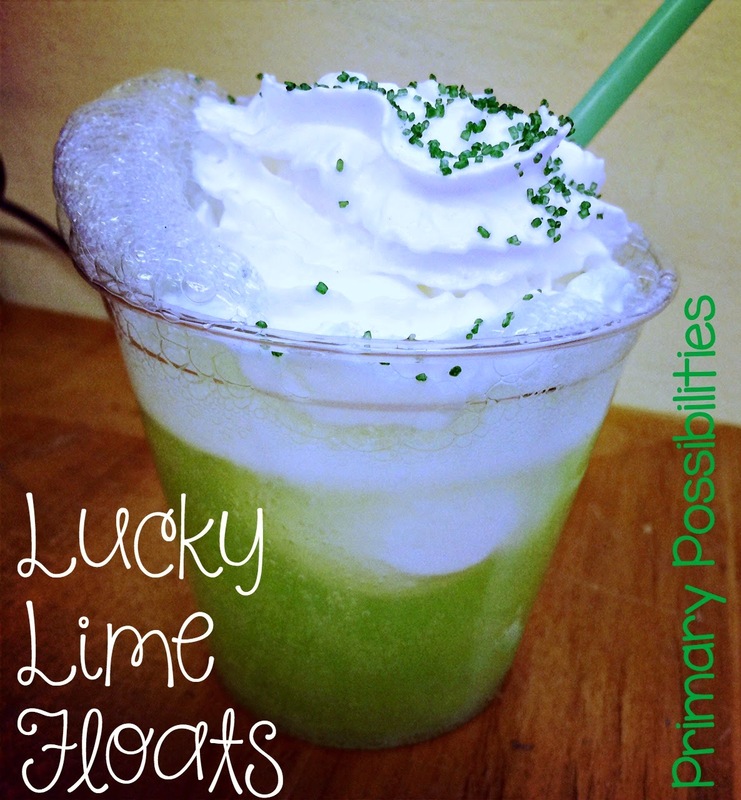 We used all of the ingredients that we found to make our Lucky Lime Floats. They are totally delicious and super easy to make. The kiddos love them every year! 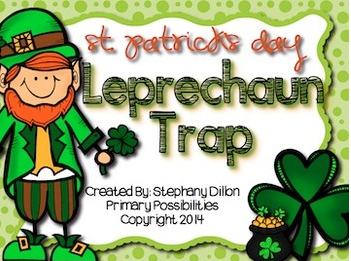 You can get the Leprechaun Trap and Lucky Lime Float activities in this packet! Just click on the image below to go grab it up! 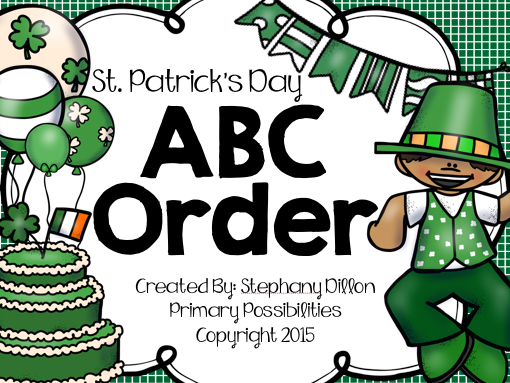 Also, grab up this ABC order (late) Friday freebie! 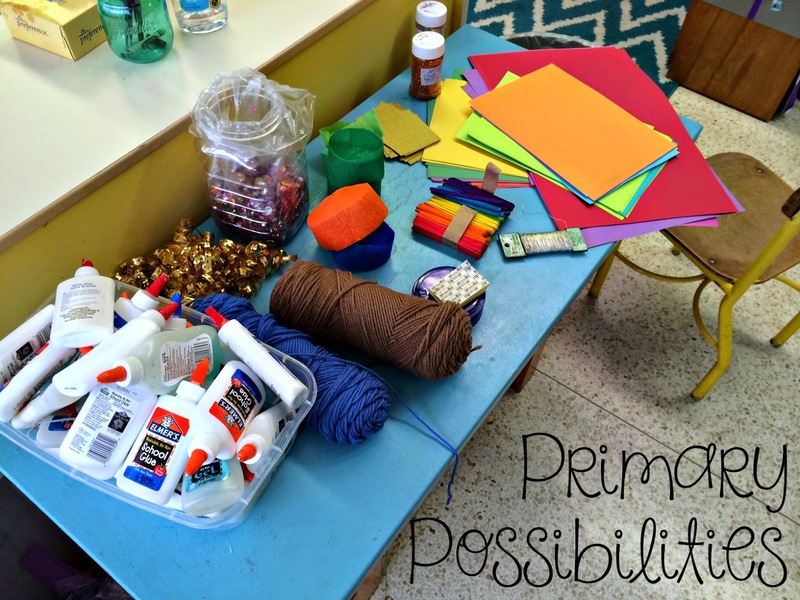 It's great for station work, centers, small group work and more! Click on the image below to download!